This survey is your opportunity to help us shape the future of Filton. The Town Council and many community organisations will use the data from this survey to help them set priorities. Have your say! Please take the time to fill in the survey. The data that will be collected for the finished Community Plan will help to attract investment to Filton. If you fill in this survey, and provide your contact details, you will be entered into a prize draw for 5x £10 gift vouchers, 1x £25 gift voucher and 1x£50 gift voucher. 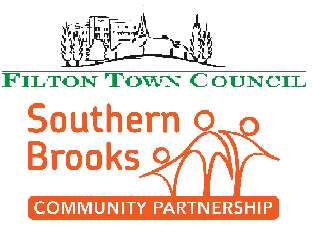 If you need any support in filling this in please contact Ali Jeffery from Southern Brooks on 01454 868 583. The survey can be left at drop off points located at Filton Leisure Centre and Filton Library. Please see last page for details of how this survey will be used. * 1. Please can you provide us with your postcode, (so that we can track which different parts of Filton have responded to survey). * 2. Overall how satisfied are you with Filton as a place to live? * 3. Over the last 3 years has the area got better or worse? * 4. Do you feel part of the community in Filton? * 5. How would you rate the following green and open spaces in Filton? * 6. How do you feel the green and open spaces could be improved? * 7. What types of green space would you like to see more of in Filton? * 8. How would you rate public transport in Filton? * 9. How would you rate road infrastructure and layouts in Filton? * 10. How would you rate road surfaces in Filton? * 11. How would you rate road signage in Filton? * 12. Do you have any comments on the above? * 13. Are the following a problem in Filton? * 14. How safe do you feel living in Filton? With 0 being very unsafe and 10 being completely safe. * 15. Are the following a concern for you as a local resident in Filton? * 16. Overall, how responsive do you feel the police are to the needs of the community in Filton? * 17. How would you rate access to advice and support in Filton?